Your simplest and most trouble-free solution would be to either consult with your installer, or email our office and send us a picture of your rough design. You are encouraged to contact your favorite bathroom contractor or renovator or interior designer to have your measurements taken and to devise your new glass shower enclosure plan. Once you have your measurements, send them to us and we will be more than happy to provide you our prices. The next thing you will ask us is "How soon can you ship?" — as we are the cheapest (also known as 'least expensive') solution to any Glass Shower design. Are you looking for a Frameless Glass Shower Enclosure for your bathroom to put between two walls? If so, consider a frameless wall-to-wall Shower Enclosure. Most modern bathroom renovators would choose a Frameless Glass Shower Screen to add to the spacious clean look of their bathroom. To do this, you will need to measure the opening between the two walls on the floor tiles by running a tape measure and getting the closest measurement. With this measurement you will be able to choose whether you want a 1, 2 or 3 panel wall-to-wall shower screen. If the measurement is less than 30-inches, we recommend one door with heights of either 72 or 75 inches. These doors are our stock items and cost much less than a custom door. Click here for our in-stock Shower Doors — but keep in mind that we can manufacture absolutely any size of Glass Doors or Glass Panels. 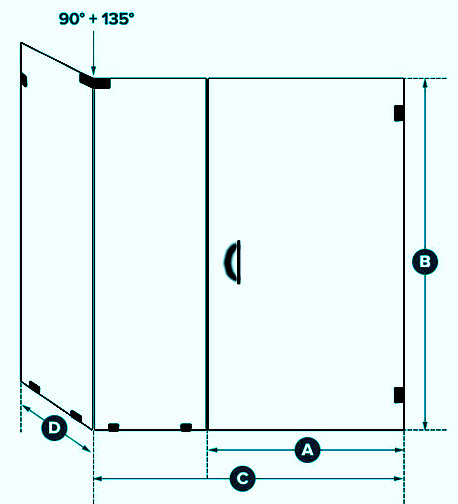 If the measurement is between 30” to 48” we recommend one Door and a fixed Panel. This will be a "one-panel with a door" wall-to-wall frameless Glass Shower enclosure. 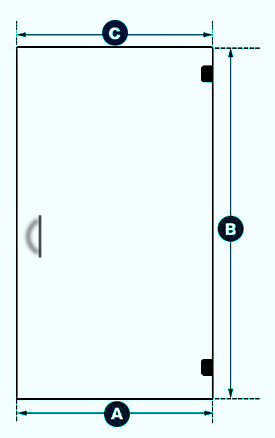 If the opening measurement is greater than 48” we recommend a fixed panel, a Door in the middle, and another fixed Panel. This will be a "two-panel and a door" wall-to-wall Glass Shower enclosure. It is good to make sure your walls are plumb (vertically straight) by no more than ¼” difference. In tough economic times like these (or at any time), we at Showers & More can help you save on your Glass Shower Enclosure by offering you a range of wall-to-wall Glass Shower enclosure sizes at significantly reduced prices. Many builders and contractors purchase their Glass Shower enclosure supplies from Showers & More because they know our quality and prices are simply unbeatable. In fact you cannot find any less expensive (a.k.a. cheaper) Glass Shower retailer than us! 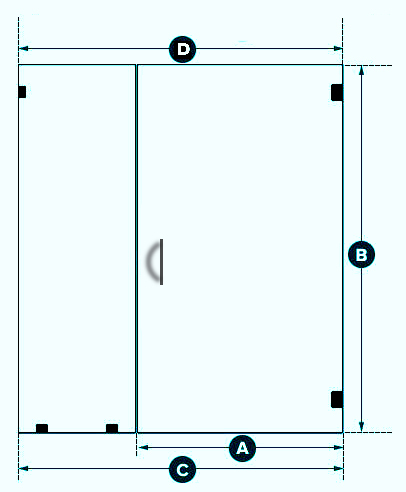 If one of the drawings on our Layouts page (over 120 layouts to choose from) fit your new shower enclosure plan, please send your measurements to us and we will promptly send you a quote. You can also send us your own drawing or a rough sketch.